It is my honor to be here and share some of my memories of Millie. It turns out that, coincidentally enough, much of what I planned to share with you about Millie have already been mentioned by Pablo and Tony! I won’t go into all the minute details of that, again. 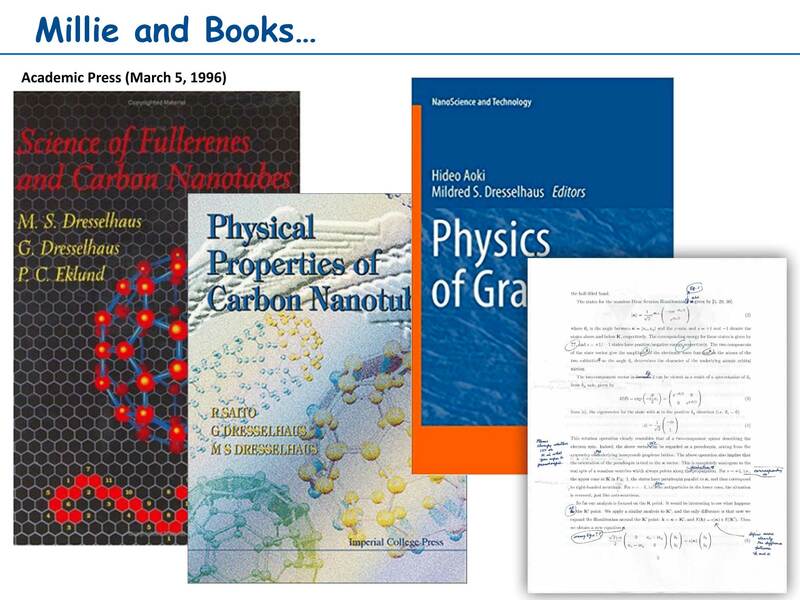 Like Pablo, these books that Millie wrote were like bibles that helped guide me through my PhD. There were a couple of other books as well, actually. Whether it was Millie and Gene, or Millie and other collaborators, Millie would continually update and revolutionize the field with numerous important monographs. Sometimes, she put forwards new ideas; other times, she summarized a body of pre-existing work in order to help focus and shape the field. And sometimes, she worked with her students and wrote papers with them. Millie’s incredible body of work is one of the most important contributions she made, over the past half-century. I was lucky enough to get involved in the Millie book-writing process, myself. When Millie and I wrote a book together, a few years ago, I had almost exactly the same experience as Tony just shared with you, in the previous talk! I’ve provided my own set of Millie-corrections in the slide above. Everyone who worked with Millie was always very touched by the corrections she made on our papers, and we all cherished them. It’s probably the reason that people keep showing them off all the time, both yesterday and today. Corrections and corrections and corrections! What amazed me most about Millie’s corrections was that she didn’t just correct the text. 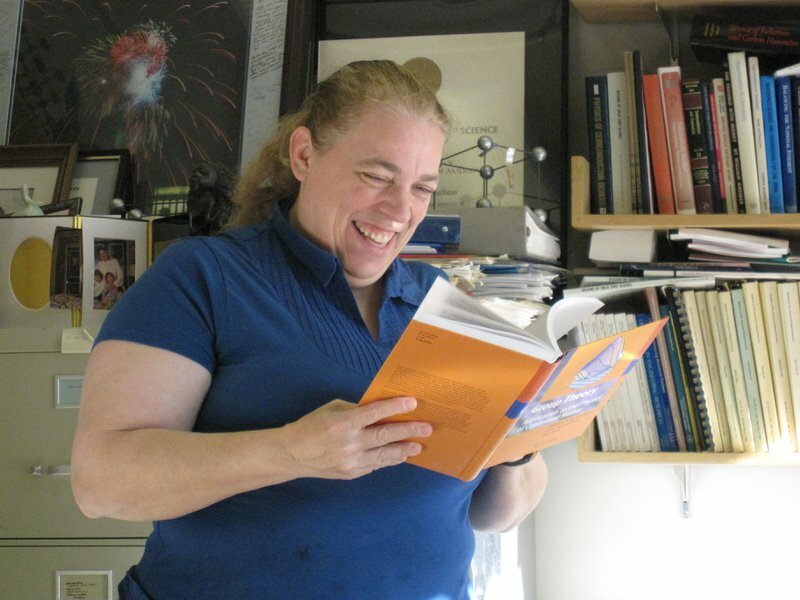 She actually went through all the footnotes, references — and even the equations! Yes, she didn’t just read through and markup the paper automatically, she actually took the time to think about, understand, and then edit the equations. I really think this is an amazing thing. What’s even more amazing is that she usually did all these corrections overnight. It was extremely impressive. I'm going to share some of the story behind intercalation compounds. Some of you may not know this, but before Millie and Gene got interested in fullerenes and nanotubes, they did a lot of very interesting research on intercalation. 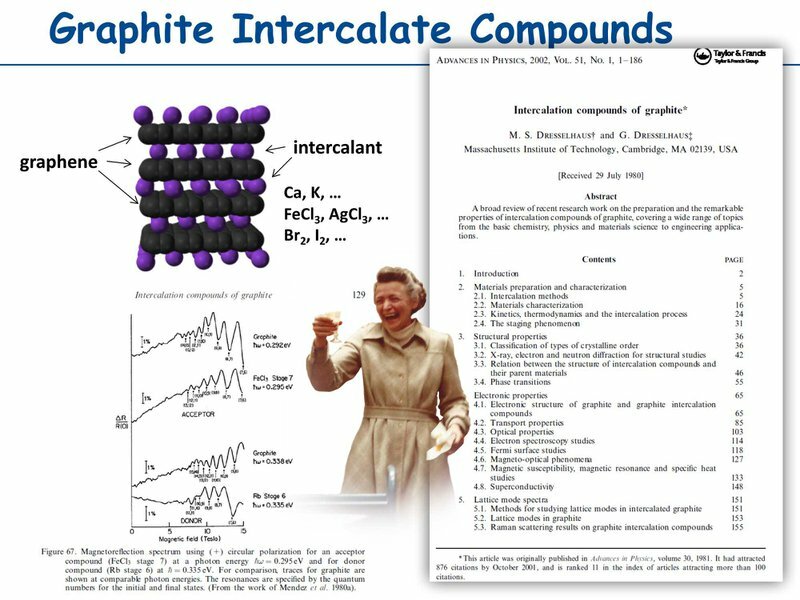 Their research and contributions were very important to the field of intercalation compounds — and mostly, to the field of graphite intercalation compounds. If you’d like to look into this, I very much recommend you look at Millie’s books and papers on the subject. 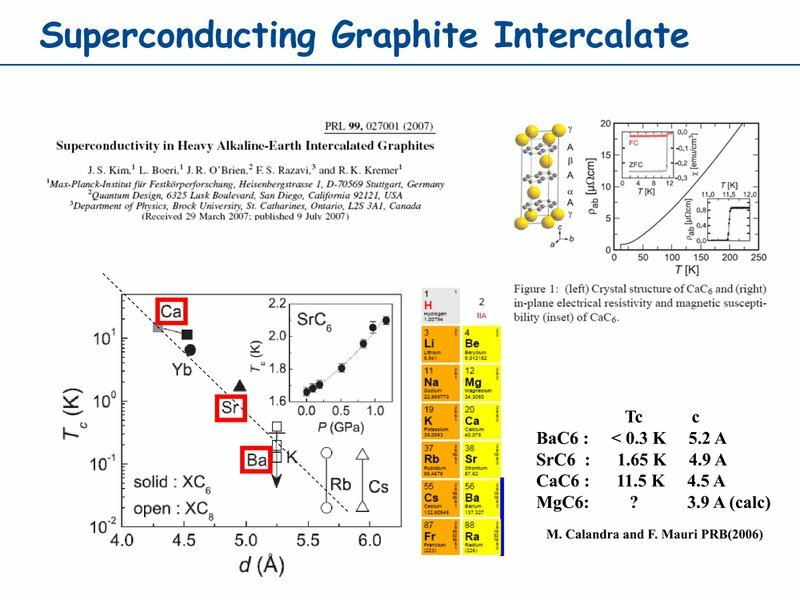 My recommendation is to start with the paper on the slide above, because understanding this paper will go a long way to understanding the science of graphite intercalation compounds. Millie and Gene didn’t just write review papers. They also contributed quite a lot to the study of interesting physical properties of intercalation compounds. For example, they studied the quantum oscillation in the magnetoresistance of some of these intercalation compounds, and they came to the conclusion that it wasn’t just the materials creating this effect — there is actually a kind of quantum mechanics phenomena that appears in low dimensional systems. 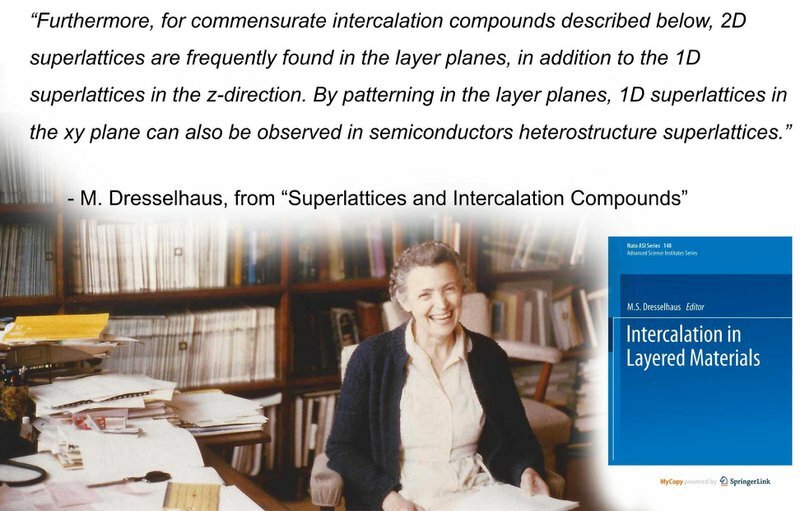 Now, looking at the fact that Millie and Gene studied this field so long ago, you’d probably assume that the field of intercalation compounds is an old field. However, it’s not! It still brings us new surprises, as more and more research is done. For example, about 10 years ago, a paper was released showing that Ca-intercalated graphite has a reasonably high temperature for superconductivity, something like 12 Kelvin. This was not expected. The expectation had always been that if you intercalate the lighter and lighter elements, maybe there would be a TC increase up to the 40-50 Kelvin range. That has not been discovered yet. So, overall, I think this is a really active field. Of course, this field has changed over the years. Think about the impact that was made upon this field with the arrival of the oldest 2D system! First of all, you can now do all the intercalation business using many different types of layered materials, and you can do it all the way down to very thin layers. 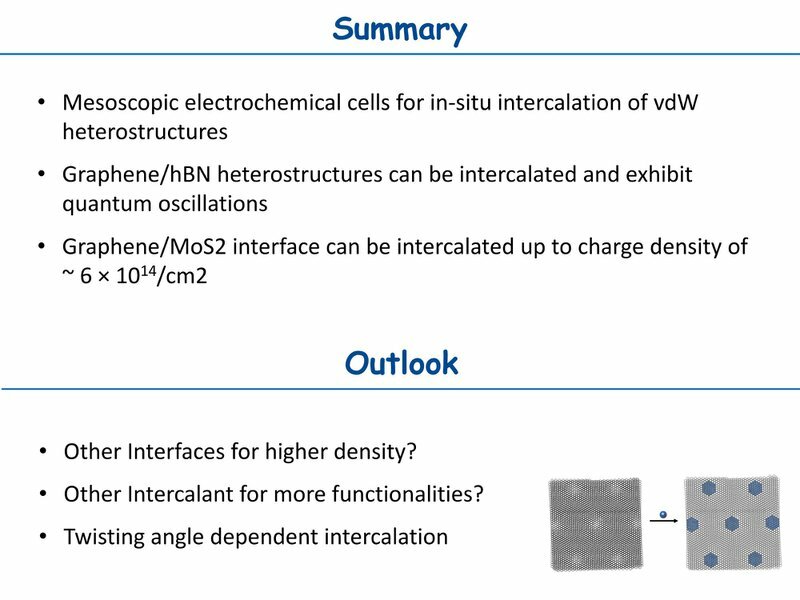 But also, more importantly, you can now create heterostructures and can start to think about new interfaces between different materials which can host the intercalants in order to turn it into different physical systems. 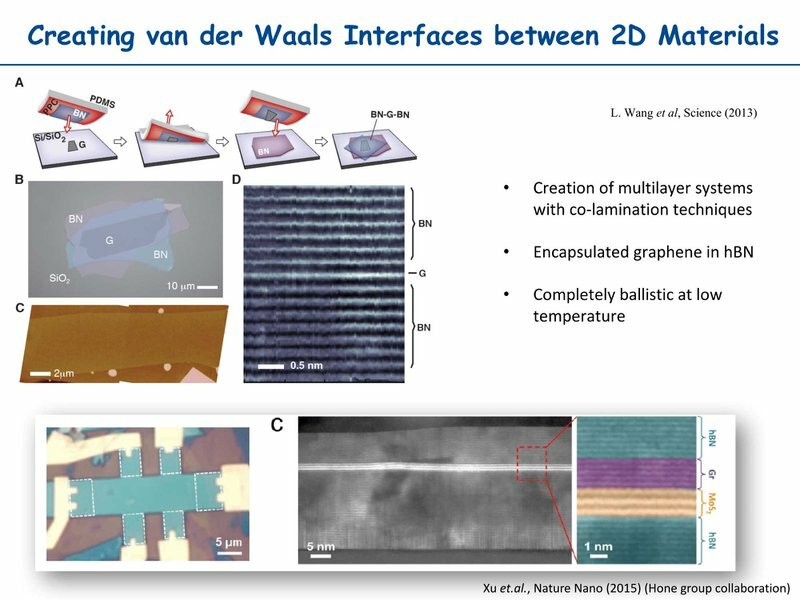 In that regard, there are two problems we should think about in this new era of intercalations with 2D materials and heterostructures. First of all, what if you just try to intercalate the materials down to really basic units — for instance, if you just try to intercalate bilayer graphene? Will the physics be different, or will the material properties be different? Those are interesting things to consider. 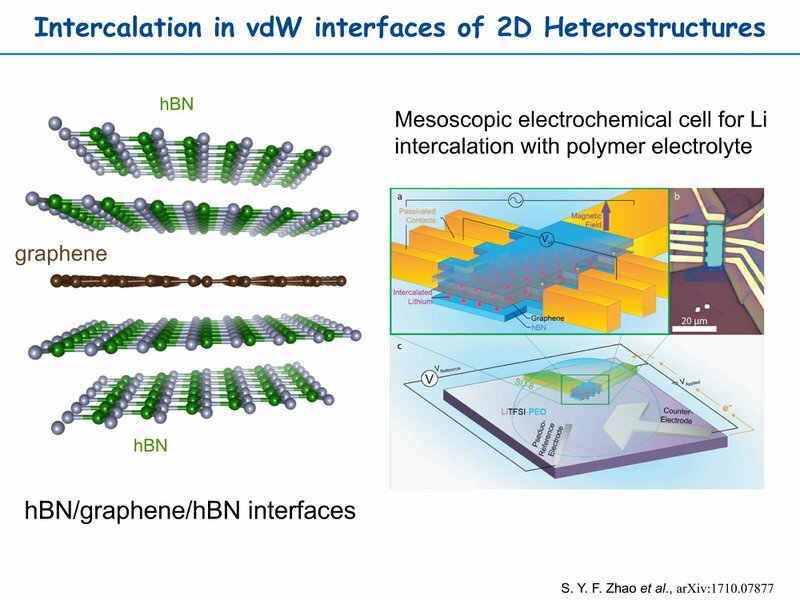 The other problem is, of course, you can always create these heterostructures between two different materials — so imagine how this intercalant would change, or how the intercalation processes will change, when you have these kinds of heterointerfaces between two different materials! This is already setting up a number of very interesting areas that one can explore. But how can we controllably intercalate those kinds of small, low-dimensional systems? That's basically the key question that we must answer, in order to answer all the others. Perhaps we could try to do the same thing we did in bulk, but do it on a smaller scale. Here is a good example that was done seven years ago, in my group — although it was never published, because it was so hard to do! Even so, this is a good example to have. 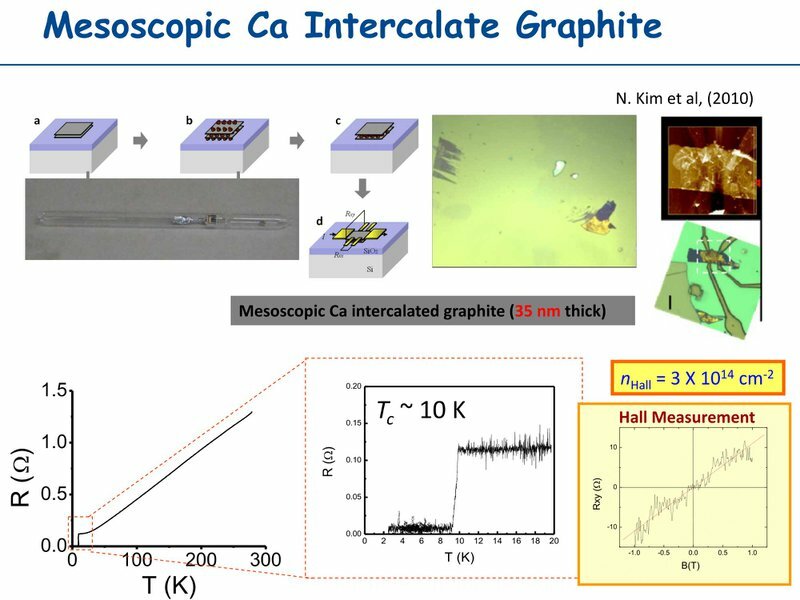 If you want to try to create Ca-intercalated graphene (single layer or bilayer graphene) and make it a superconductor, we thought you could follow the same process as you’d use for bulk intercalation. You create the samples and then you need a way to force the calcium in between the graphene sheets. We do this using a saturated calcium vapor which diffuses in between the layers. Then we measure the resistance to see if there’s a temperature range in which it acts as a superconductor. Of course, there are problems with this — because calcium interacts with air. So you can’t build it in that order. You have to attach all the wires to create the device to measure the resistance first, and then you can evacuate the air, which allows you to intercalate the calcium without interference. You do the intercalation by putting it in an oven. But because you had to do it in a funny order, oftentimes, the calcium boils over and destroys the device. Very few devices survive, so it’s hard to get good results. So this is a really hard experiment to perform, but if you stick with it long enough and eventually get results, you’ll find that a few layers of graphene can be intercalated into a superconductor. That's good! But the downside is that there is not much controllability. When using such a small number of layers, we simply cannot control the intercalation well enough to reliably build an effective device. Of course, perhaps there is a way to gain control. If we can re-adopt technology — such as electrochemistry — then perhaps we could control the intercalation process! Electrochemistry is, basically, the same technology that we all have in our pockets — lithium ion batteries (in your phone or your laptop) contain electrochemistry and undergo constant intercalation and de-intercalation. Can we use this electrochemistry to redo our previous intercalation experiment, but do it in a much more controllable way? A way that enables control down to a few layers of graphite? 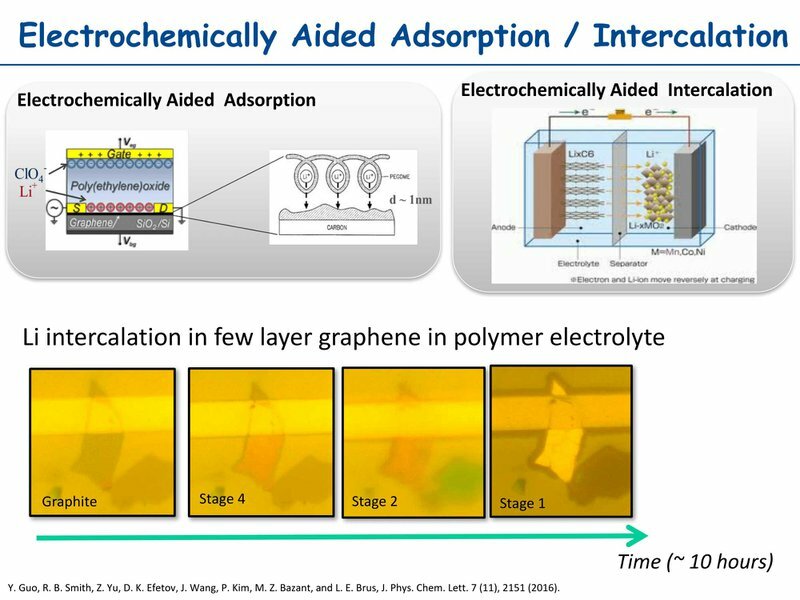 For example, in the slide above, you can see how we’re taking a few layers of graphite and placing them in an electrolyte solution (which contains lithium). By applying the electrolyte gating voltages to the graphite, the gating voltage draws the lithium in between the layers, so we can start to see the intercalation happening. Then, either using Raman spectroscopy or optical absorption measurement, you can measure the intercalation process. All this is illustrated in the collaborative work that we did while I was at Columbia. Even more fascinating work was done, quite recently, by Jurgen Smet’s group at the Max Plank Institute at Stuttgart. 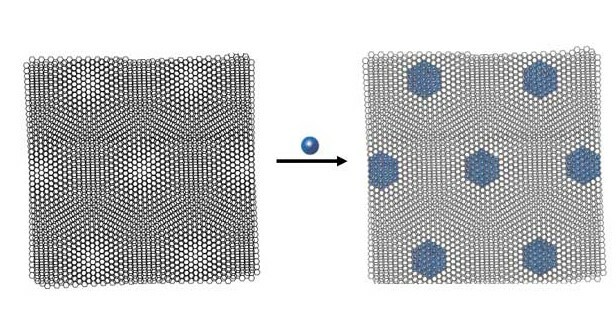 In this case, they used bilayer graphene — but they only used a partial part of the sample while it was in contact with this polymer electrolyte. And, by applying the gate voltages, they could drive the lithium into the into the bilayer graphene. They can, therefore, measure how the intercalation propagated through the bilayer graphene, simply by measuring the Hall voltage as a function of the distance between the lithium sources. 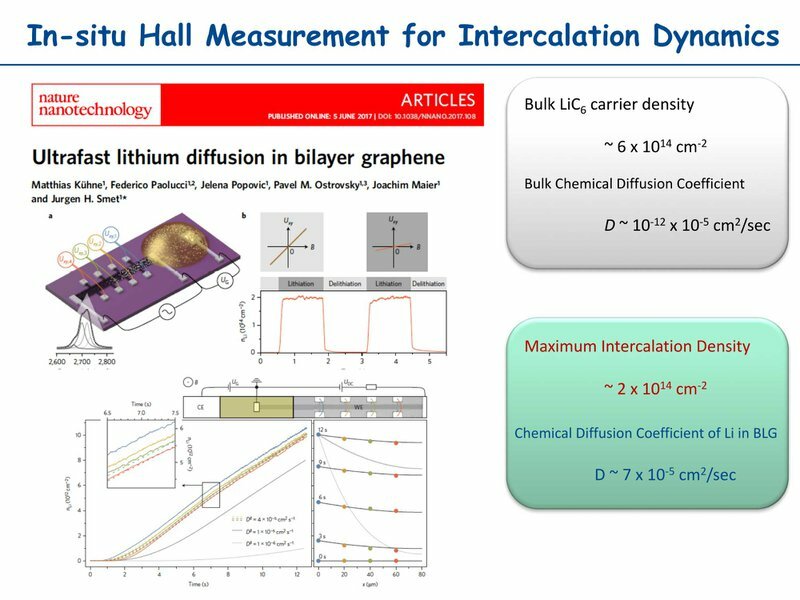 From there, they can estimate the diffusion constant of the lithium intercalating into the graphene, as well as the maximum chemical intercalation density. We can probe the details of intercalation process in further steps, but that isn’t so important. What’s important is that, now, we can finally study intercalations right down to a small number of layers, and we can see how the intercalant propagates. 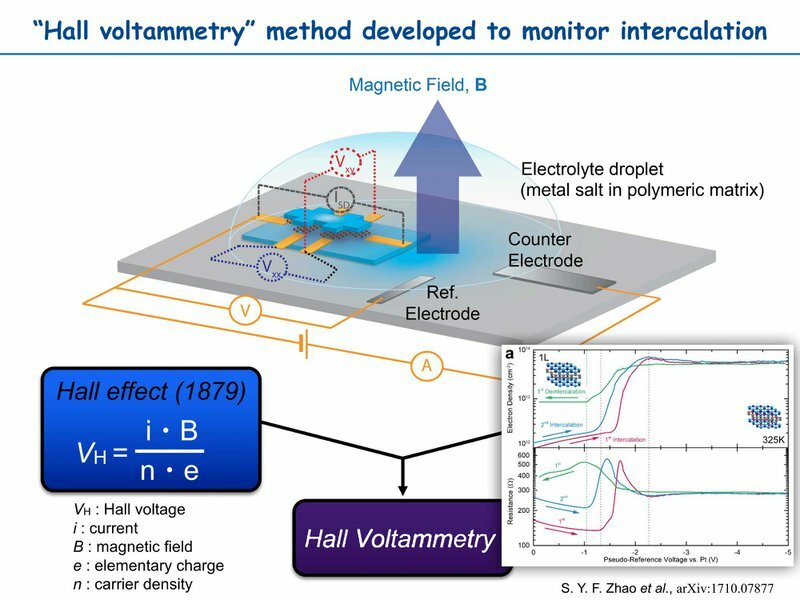 This is an experimental method that we can use with electrochemistry to drive this intercalant into the system and to monitor those kinds of intercalation processes in mesoscopic device form. 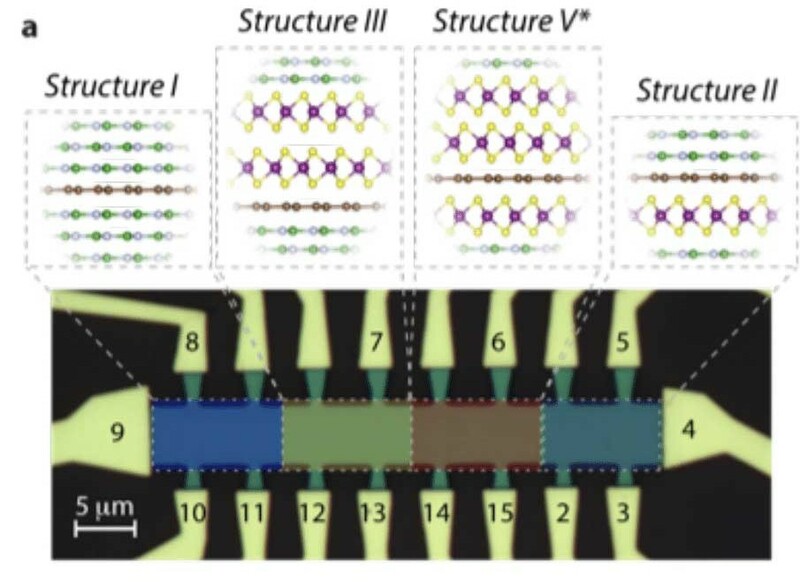 But now, think about this: how about we sit down and create some of these heterostructures? Of course, in this 2D research community, we know how to create these sorts of heterostructures. On the slide above, you can see a good example of this — graphene encapsulated in the hBN. 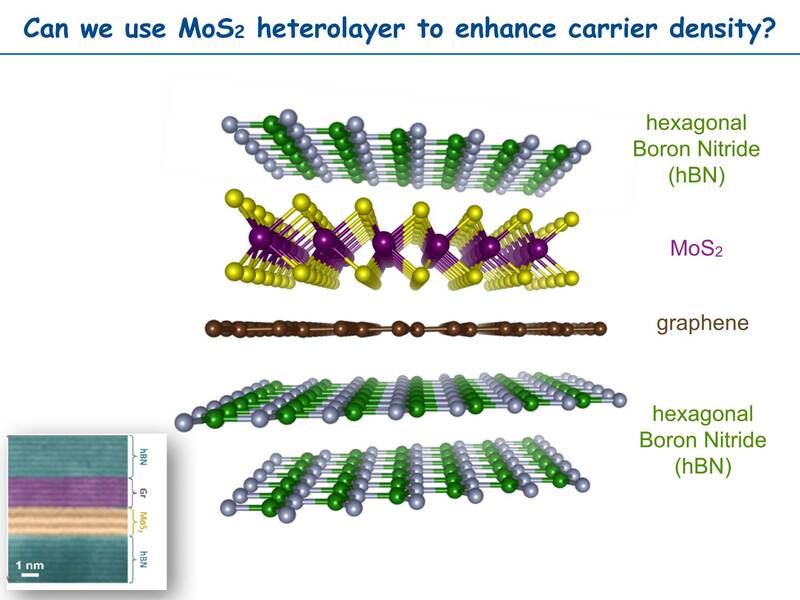 You could even create multiple stacks of graphene in hBN and MoS2. So we can create many different heterostructures! And, using the electrochemical method described in the previous slide, we can intercalate some of these interfaces by controlling the chemical potentials. The first example that I want to share with you is one which uses basic simple units — graphene in between hBN. 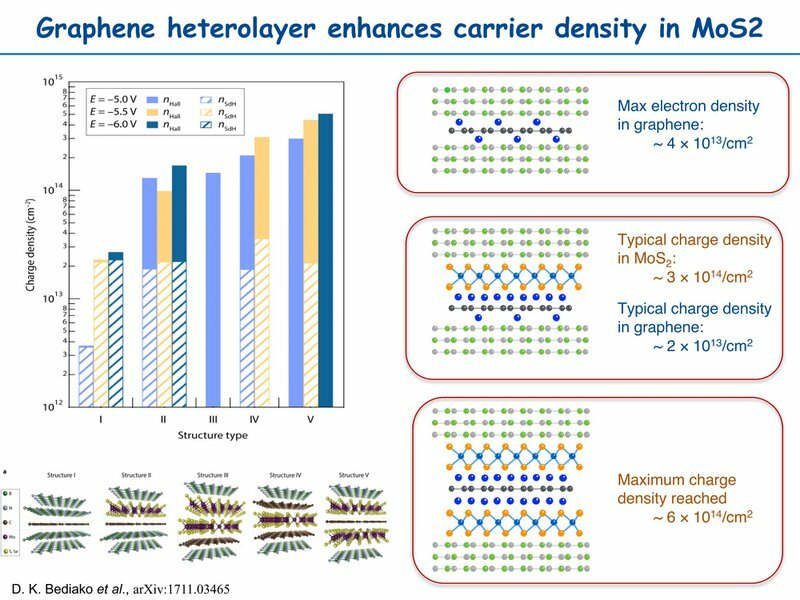 In this case, we have created this heterointerface between graphene and hBN. Can I intercalate something in between these two, but do so in a controllable way? To do this, you’d have to control the intercalation process to make sure it only happens through the part of your sample that is in contact with the polymer electrolyte. You have to drive the intercalant in there, while still protecting all the electrodes you inserted and making sure the electrolyte does not destroy them. This allows you to do the intercalation without destroying the device you need to measure it. You can already see how complicated this is. But, at the end of the day, you can make the mesoscopic scale of electrochemical cell and can apply the electrolyte gate voltages to monitor how much the lithium (in this case) is creeping into the interface. Of course, you are monitoring those kinds of processes by simply measuring the Hall voltage in situ. And you can do this by changing the gate voltage up and down, and just measuring Hall voltages — measuring how much intercalation is happening. In essence, therefore, you can just do the cyclic voltammetry instead of measuring the leakage in current in a typical electrochemical cell. 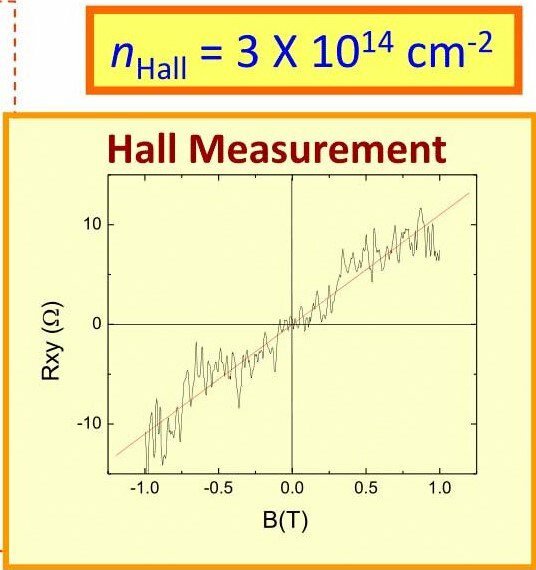 In this case, you measure the Hall carrier density, in order to monitor the intercalation process. We call this “Hall voltammetry.” Those kinds of mesoscopic samples can be measured back and forth, allowing you to properly see and monitor the intercalation, and the process of intercalation is happening through the sample in a reasonably reversible way. Now, due to time, let me just give you the highlights. Take a look at the red and blue lines in the graph above. These are electrolyte gate voltages that we have applied. You can also see, on that graph, the density we measured from the carrier density —by a Hall measurement. And also depicted on the graph is the resistance we monitored at the same time. What you see is this: in the beginning, when the gate voltage is small, intercalation is not happening — to put it simply, this is because there's electrolyte gating happening. But, at some point, you just go through this activation barrier, and then intercalation stuff begins to happen. As you can see, the density of the carriers steeply increases and saturates, at some point. But, at the same time, the resistance goes up (initially) and then comes back down. In other words, the mobility goes down (initially) before coming back up, again. And that process occurs when this intercalation is happening. Having more or less intercalant will likely be distributed in a disordered fashion, thus creating more scattering centers. But once you complete the intercalation, they are (more or less) arranged in the periodic fashion, so they're reducing this scattering process and that will recover back this mobility, in such a case. So we know that this kind of thing happens. Now, we can extend it even further, and we can attack some of the more complicated interfaces. So, in this case, we’re encapsulating molybdenum disulfide and graphene in between two layers of hexagonal boron nitride (hBN). Again, the device is exposing one of the electrolyte layers. And then, we can try to intercalate some of these layers, because we want to see how, preferentially, the lithium (in this particular case) is intercalated into the system. This is an example of the device (see left). This is in the shape of a whole bar, but each of these color sections actually contain a different configuration. 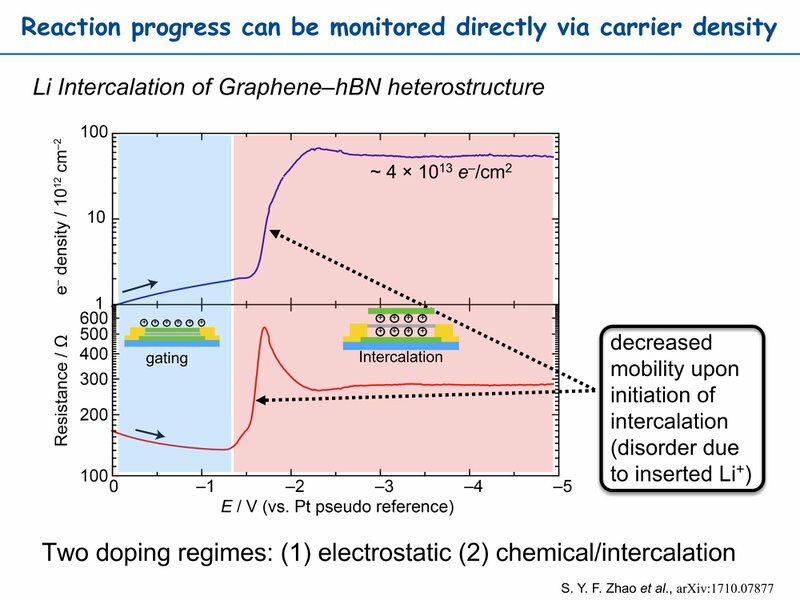 For example, Structure I is graphene in between hBN, as I discussed. 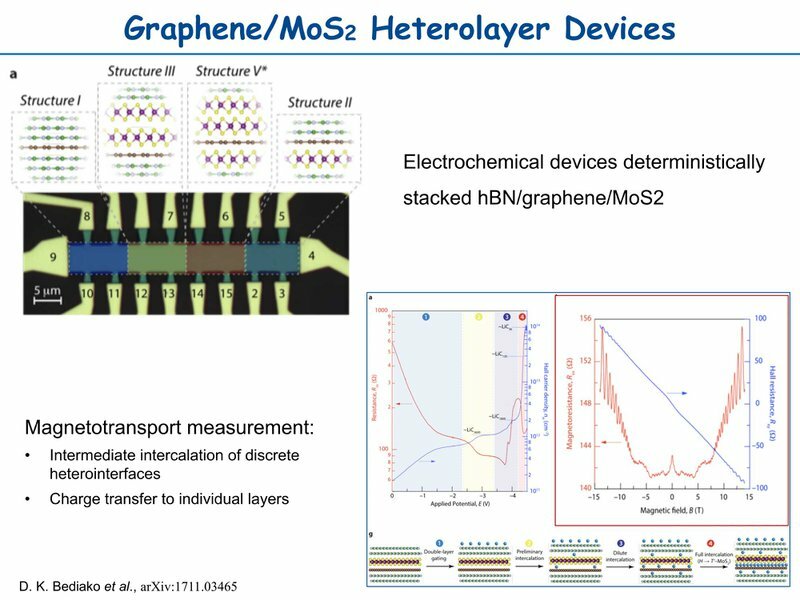 For another example, in Structure V, there are two layers of the MoS2 that are interfacing with graphene (two layers of MoS2 on the top, and one layer of MoS2 on the bottom). So you can see that you can create this kind of device using many different configurations of these sorts of layered materials. Now, you can use exactly the same method I described before. You can tunnel the electrolyte gate voltages, and lattice electrolytes start to diffuse into the system. At the same time, you have to monitor the Hall voltages of each of the sections and measure the resistance, and you'll start to get information on how many carriers we have to drive in at certain gate voltages, as well as information about the mobility of the sample. Basically, you can go through many similar experiments measuring Hall voltages, but after a while, you’ll start to see that whenever you measure a Hall voltage, you are essentially measuring the carrier density of all the interfaces. Doesn't that distinguish which layer actually got more of these carriers? Since this graphene layer carries a reasonably high mobility in the quantum oscillation in a high magnetic field, we can determine and measure that. This quantum oscillation starts to tell us about the density. In other words, by using certain carriers that have high electrical mobility, we can also extract the density from the quantum oscillation period. Out of all of these configurations and by measuring these different configurations, we can, in principle, extract all these individual interfaces — and discover how many carriers got inserted in each of these complicated situations. So, skipping all the details, I'll give you a quick summary of what we get. Here are a few different structures, and you start to see that there is a different type of carrier density that exists in the different interfaces. If I could just summarize, quickly: more or less, graphene in between boron nitride gets about this: maximum 4 x 1013 electrons per cm2. This happens no matter what you're interfacing with — whether it's boron nitride or molybdenum disulfide, it doesn't matter. This is always the case. Now typically, when you have graphene and molybdenum disulfide — as you do in this particular case — this interface is where you draw most of the charge. But, interestingly enough, what actually happens is that when lithium donates its charges to this interface, instead of spreading the charge evenly between the two layers, the molybdenum disulfide gets about ten times the amount of charge as the graphene. It turns out, the amount of charge generated by this doping in the molybdenum disulfide — 3 × 1014/cm2 — is actually more than the charge you’d get if you were analyzing an interface between two layers of molybdenum disulfide. So somehow, when you have an interface between graphene and molybdenum disulfide, molybdenum tends to get the advantage — basically, more of the lithium gets into that layer, so molybdenum gets most of the charge donations. This may be an interesting direction to research, if we can push this effect and enhance the capacity of energy storage onto this molybdenum layer. 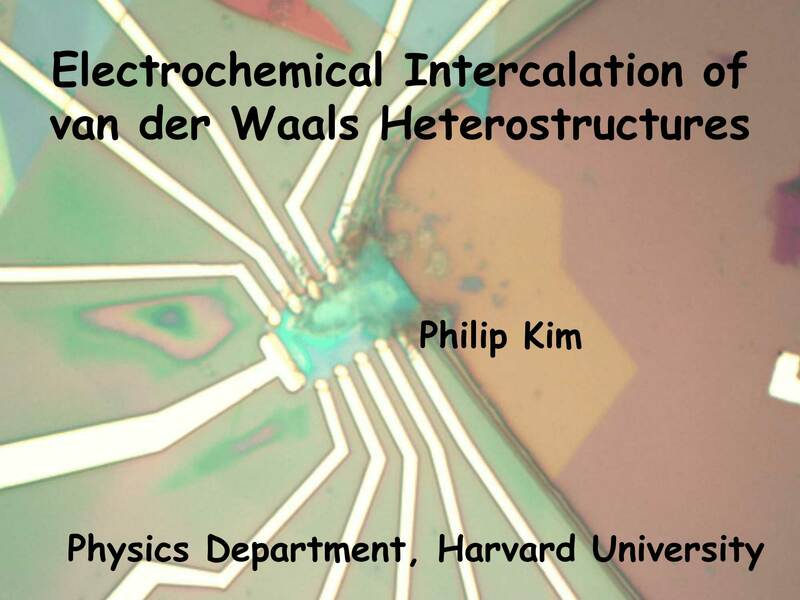 This a good summary of how this new type of interface in van der Waals systems can be useful in terms of realizing the intercalation process. Of course, the work on this subject is only just beginning, so we can only imagine the possible ways we might expand on this subject in the future. What can we do, next? Well, keep in mind that the materials we used thus far, namely graphene and molybdenum disulfide, were not chosen for any specific purpose — we just randomly chose them. What if we just apply this same technique to different types of materials — ones chosen because they have interesting properties? How about black phosphorus? How about tungsten diselenide, niobium diselenide, etc.? In all these different interfaces, how will the intercalation happen? What kind of physical properties will we see? This will be quite exciting to explore. But not only that! 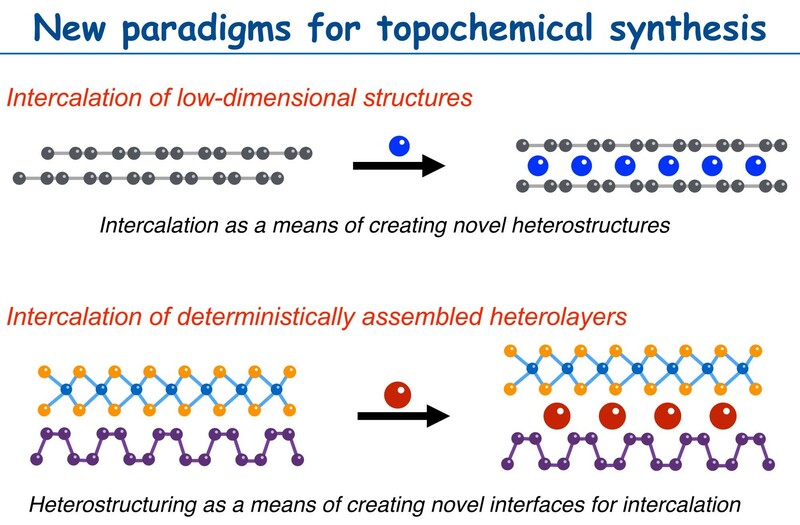 Even for the same materials, we know that by twisting one of the layers against another, we can create different interfacial patterns (see right hand figure). And then this moire pattern in the graphene shows spatially distinct regions. In this AA side or AB side in graphene moire, for example, a different type of buckling process can occur, and their different separations can house different types of intercalation processes. What if we intercalate those kinds of systems? What kind of spatial distribution will we get? These are the kinds of interesting questions we can ask, in the future. A small caveat to my musings — this is not the first time that this type of question has been asked! I recently flipped back through Millie's old book, again, and found one of the quotations so inspiring, I copied it down. Even back then, Millie already envisioned something similar, albeit in graphite intercalations and not in graphene. We asked if you could create certain types of superlattices by patterning or other types of processes — and in Millie’s book, she actually poses a very similar question. What kinds of two dimensional network or two dimensional superlattice can you create in combination with these intercalations? Funny how many years have passed, yet we're still asking such similar questions. But it’s also fortunate, because it means that my group and I can always get inspired by rereading Millie’s books. And although Millie has just left us, her ideas and inspirations still live on with us inside her books, and I think those books will continue to guide us towards new enlightenment. All right. I think that's all I have to say. I want to thank the guys who actually did these experiments. 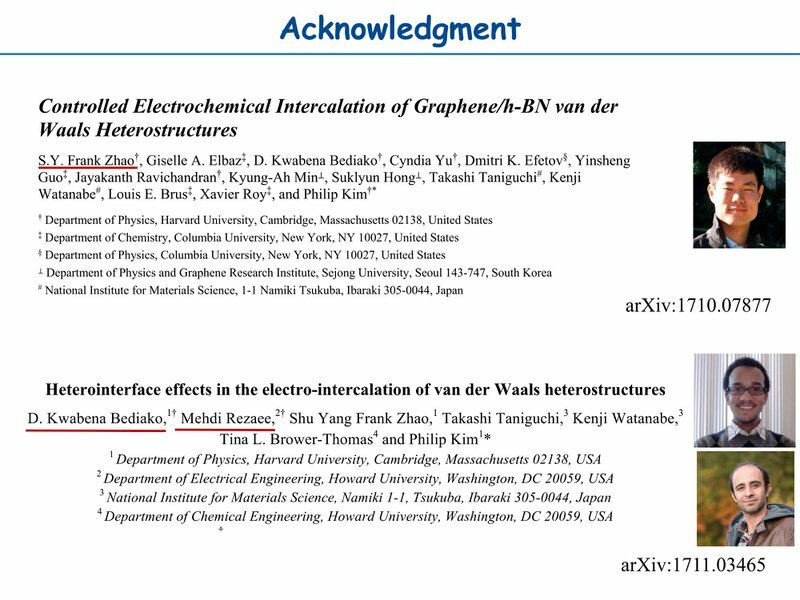 The first part, graphene intercalated in sodium boron nitride — that was done by Frank Zhao. 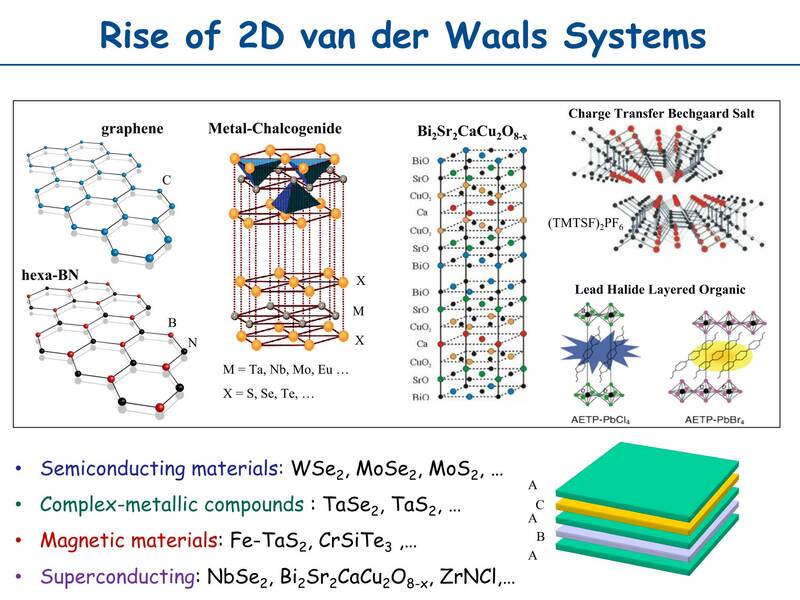 And the second part that I was mentioning, about molybdenum disulfide and the graphene intercalation, was led by D. Kwabena Bediako and Mehdi Rezaee.